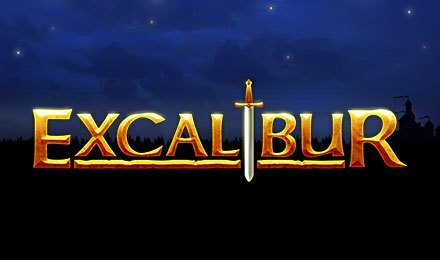 Witness one of the most captivating love stories of all times with Excalibur Slot by NetEnt. This five-reel slot game reflects the tale where the Prince is kept away from her beloved, only to be guided by a magician. All due to the evil witch. The latter informs him that only Excalibur, the legendary sword of the mighty will be able to reunite him with the Princess. The marvellous story was enclosed within the reels of this slot game and now, you can experience it at Vegas Spins! Excalibur Slot displays five reels lined with golden frames ornate with Celtic designs. The simple backdrop of the reels contrast with the highly detailed symbols. The whole set of reels is placed in a dark room where two chandeliers at the sides seem to light the way. Take a deep breath and start playing on Excalibur Slot. Adjust your bet on Excalibur Slot by selecting a preferred coin size on the Coin Value tab. Click repeatedly on the Bet Level, Bet Lines or Max Bet tabs to set your preferences. Hit the Spin button or make use of Auto Play to enjoy 15, 25, 50, 75, 100, 250, 500, 750 or 1000 spins played without any interruption. Bet Levels: On Excalibur Slot, players may utilise four bet levels during their gameplay. This allows them to adjust the total bet. Amount of Paylines Selection: You can select from 1 to 20 pay lines to play on Excalibur Slot. Modify the amount of active pay lines by accessing the Bet Lines Tab. You can check out the number of active pay lines currently in game through the tab at the bottom of the screen. Coin Values: You can set the values for your coins. Select between a pool of values like 0.01, 0.02, 0.05, 0.10, 0.20, 0.50 and 1.00. The Excalibur Sword stands for the Wild Symbol. This allows the symbol to act as a substitution for any other symbol of the game except for the Scatter Symbol and the Golden Wild Symbol. The Golden Wild Symbol is quite unique. Sharing traits with the usual Wild Symbol, it will also substitute for any other symbol of the game except for Scatter Symbol. This symbol appears only on the middle reel and if it substitutes in a winning combination, the wins are multiplied by 4. In addition, all wins generated during the Free Spins Feature are tripled!